A 92-year-old woman with a history of stroke comes to an emergency department and is found to have fractures of her cervical spine. Neurosurgery sees her but doesn't think she needs surgery. The emergency department physician tries to admit her to the hospital as she has a new functional disability due to the fall but the hospitalist refuses as the patient doesn’t meet criteria for inpatient admission. And there she sits for another 23 hours while her fate is being decided… She has now entered a new state in modern medicine: purgatory. 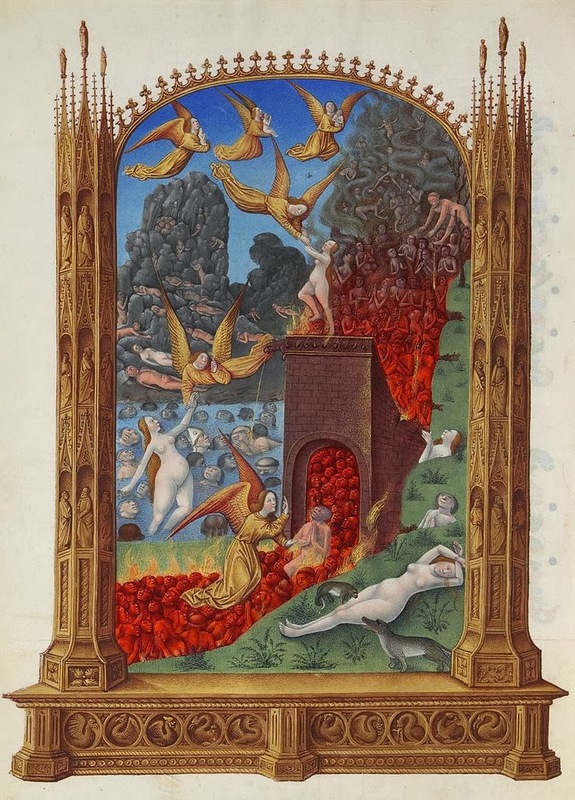 "Purgatory" can be defined as "a place or state of temporary suffering or misery." This is a very apt description, used in a recent JAGS article by Timothy Platts-Mills, Scott Owens, and Marvin McBride, for what happens when patients are seen in the emergency room for an non-surgical injury but don't meet standard hospital admission criteria (as detailed in the InterQual guidelines) and can’t safely return home because of new functional difficulties from their injury. I'll lay out a brief summery of some of the options in these situations, although you should really go to the paper (here in JAGS) as it does a really wonderful job describing many of the issues for each type of placement. 1) Admit the patient to the hospital: the problem lies in the fact that many of these older adults with non-operative injuries may not meet inpatient criteria despite having new functional limitations that prevent them from going home safely. Some doctors may try to build a case for an admission, but this may require a lot more testing and interventions than the injured older adult actually needs. Even if they do get admitted, they run all the risks of inpatient admission including hospital associated disability, poly-pharmacy, delirium, and hospital associated infections. 2) Place them under "Observation": the goal is to create a short-stay, observation status (not quite inpatient, not quite outpatient) to evaluate an outpatient's condition or determine the need of an admission to the hospital as an inpatient. However, Sheehy and colleagues found that 17% of observation patients stayed more than 48 hours, and 1 in 4 stayed longer than 48 hours for those admitted to the hospital under "observation status". Older adults with a new non-surgical injury are likely going to be in the hospital longer than just 24 hours because of new functional limitations due to the injury, as well as lack of good discharge options as observation doesn't count for as part of the 3-day qualifying stay for Medicare paid skilled nursing facility. Furthermore patients don't like it because of a high copay with observation stays (see this New Old Age post) and hospitals don't like it as reimbursement for observation patients generally falls below the costs of a stay. 3) Skilled nursing facility (SNF): this may be a good option as it is focused on regaining function, the problem is that it just takes too long to get individuals into SNF care and for most elderly, the cost of skilled nursing facility care isn’t covered without 3-day qualifying inpatient stay (which doesn't include observation status days). So it is only the rare occasion when a patient is placed in a SNF directly from the emergency room. 4) Discharge home with additional support: this option is probably where most older adults want to be but the challenge is to get the right care into someone’s home takes some time and also takes money, something that is often in short supply in the emergency department. This is such an important area. We are using 1980s policy for a 2014 world. In my experience in AZ with lots of medicare adv: Medicare advantage plans that would take a case like this and direct admit to SNF (legal for them)which really best fit the patient need. BUT when this led to inappropriate transfer of a patient needing admission= recipe for disaster. While patients would like to be at home, I have concerns about blanket policies that would allow for 'increased home health services' for regions that don't have adequate home care coverage as it is now, and can't provide 24/7 home care. Excellent points, Eric. Since the early 1990s, when I started a SNF Team in our heavily managed-care penetrated primary medical group in San Diego County, we have been direct-admitting patients from the ED to SNF (which is where they belong in the first place). Bad outcomes are rare because these people are usually not critically ill. They have conditions like L1 compression fractures, or pyelonephritis without sepsis, and are going to need some rehab anyway. Why cause the disruption and potential for errors with an extra transition? In the old days (before Recovery Audit Contractor [RACs]), it was common for such patients on straight fee-for-service Medicare A to be admitted to the hospital for three days of "parenteral pain control" or "IV hydration and antibiotics," even though those services can easily be given in most SNFs. But no hospital is doing that now... too much financial and regulatory risk--plus, it's just not medically necessary! Thankfully, the second round of ACOs, like true Medicare Advantage programs, can do these direct admits without the ridiculous, antiquated, idiotic 3-day qualifying stay. I believe as we see more Medicaid managed care come to the fore, we will see this as an increasingly appropriate way to provide the best care for our patients. At AMDA-Dedicated to Long Term Care Medicine (formerly the American Medical Directors Association), along with many other stakeholder organizations, we have been trying to get CMS to do away with that rule, but so far no success. I believe that with the move toward more efficient care processes, maybe this will ultimately happen. I certainly hope so. We can take care of pretty darn sick people in nursing homes, and despite their generally poor perception in the public eye, they are for the most part a really good place for a frail elderly person to get individualized, compassionate care, with an eye to functional status, quality of life, and appropriate discharge planning. The quality and skill sets of nursing home personnel have really gone up in the last decade, as the acuity level of the patients we look after has increased. Thanks for the post, Eric. It is purgatory, but to extend the metaphor, it is truly Limbo for many of our patients because they have done nothing to deserve this fate. As Karl mentioned, as part of the pioneer ACOs, many of us are now part of the 3 day SNF waiver program, meaning that ACO patients can now be direct admitted to SNF. Everything old is new again--even though MCO's and PACE organizations have had experience with doing this for decades, there is concern about whether this can be done safely and I suspect there will be intense scrutiny of these patients' transitions and outcomes. If I'm really 'unsafe to be discharged home', please discuss that with me rather than telling me what I 'have to' do is stay here and wait. My mother and I are both people who would rather die in our own beds than suffer 48 hours of purgatory that causes further deterioration. Now that I've worked in the hospital's ER a bit, I feel even more strongly about this. What's the cognitively intact elder to do? Please STOP with the alphabet soup. I've figured out what SNF means....but what the hell is an ACO???? since that apparently is needed. others may see hospice as a way out, especially, as is often the case, if these elderly with a non-operable injury often have other comorbidities which probably contributed to the injury in the first place and be used as potential hospice diagnoses (think advanced Parkinson's with unsteady gait or end-stage dementia). What a great discussion! This is a daily challenge across the country. Hospice could be the answer, but Medicare has made it harder and harder to "certify" patients as terminal. The requirements are so stict now, fewer patients are recieving the benefits of hospice care. In my opionion the best solution is contracting with SNF for those patients that need direct admissions for rehab. I think CMS needs to get with the times and update these old regulations for our ever aging population.